Want to work for Vogue? A resource for anyone who wants to work in fashion. Don't know Oscar de la Renta from Emilio de la Morena? Don't know Mariacarla from Viktoriya? Don't fret: with weekly profile updates of models, designers, stylists, and so on, you'll know who's who in no time. Add to that reviews (cultural enrichment and savvy is surely what makes good journalism), titbits from my struggle to make it into magazines and general fashion features and you've got yourself a blog..
Jean-Charles de Castelbajac, also known as JC/DC, born 28 November 1949 in Casablanca, Morocco, is a fashion designer. 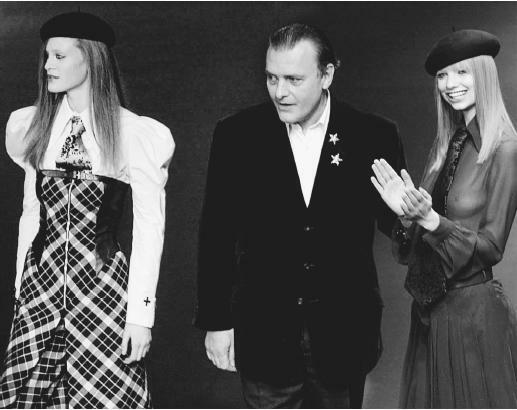 As the Marquis de Castelbajac, he is a French nobleman. He has enjoyed international success with some of his creations, including a coat of teddy bears worn by pop star Madonnaand by supermodel Helena Christensen in the film Prêt-à-Porter. As well as his imaginative clothing collections the designer creates home furnishings. In 1979 de Castelbajac married fashion journalist and model Katherine Lee Chambers. They had two sons but the marriage ended in divorce. The designer is currently engaged to actress Mareva Galanter. "A Campbell's soup can dress, a 'fur coat' made of teddy bears, giant Snoopy t-shirts and inflatable ponchos - these are the witty and flamboyant designs of French fashion maverick Jean Charles de Castelbajac. An inspired collaborator, his design work includes ready-to-wear as well as cars, sportswear and interiors. A fashion star of the '70s and '80s, his idiosyncratic designs mix bright colours, pop culture and humour. The mid-70s saw him dress Farah Fawcett for the hit TV series Charlie's Angels and collaborating with Mick Jagger and Elton John. His rainbow flag vestments for the Pope earned him further fame. Castelbajac's childhood was spent surrounded by the bleak colours of a military boarding school. He 'highjacked' materials in his first show, refashioning materials such as oilcloth sponges and floor cloths into an award-winning collection. The star of the show was the coat cut from his boarding school blanket. In 1972, Jean Charles joined the Créateurs et Industriels run by the architect Andree Putman. Later that year, on a visit to London, he met Vivienne Westwood, Malcolm McLaren and the New York Dolls, who were all to become lifelong friends. After this trip, Jean Charles ditched his muted palette for richer and more vibrant colours. In 1976, years ahead of the ubiquitous puffa jacket, he created his famous duvet ski jacket with transparent plastic pockets filled with brightly coloured feathers. In the '80s, a lifelong fascination with graffiti inspired his work with Jean-Michel Basquiat, leading to the creation of their show stealing gown in 1984. He also worked with artists such as Loulou Picasso, Robert Combas and Jean-Charles Blais to create a line of pop art dresses featuring their works of art." "Jean Charles’s use of materials is truly unique and…well lets say odd. From a plastic “fish fin” inspired dress to a dress consistent of Michael Jackson’s face and real hair (a key element this fall – also seen as “hairy shoe boots” at Balenciaga), there is also a Andy Warhol dress of the same type and a sequined leopard print dress.We love the muppet theme and stuffed animal coat which is a “remix” of the teddy bear coat JC/DC once made for Madonna." "The designer also makes home furnishings, reviving traditional furnishings (such as the Chesterfield sofa and the Medaillon style chair) with the colors. A line of carpets, light fittings, porcelain and household linen also reflect the Castelbajac style." "No one doubted the success of Jean-Charles de Castelbajac's art exhibition Triumph of the Sign when the fashion legend went all arty on us with his first solo show. No, we knew Bethnal Green’s Paradise Row gallery was in safe hands because art, as his clothes proves, is the natural progression for Jean-Charles’ 40-year obsession with pop art. 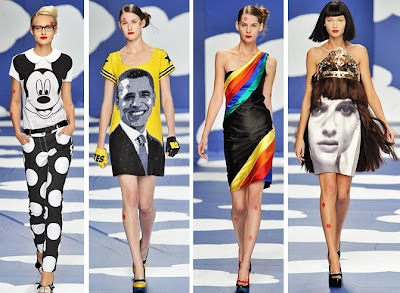 Jean-Charles de Castelbajac or JCDC as we like to call him, has “culturally hijacked” our society since 1969, and whether it has been with Barack Obama dresses, Lego leggings or Kermit the Frog coats, he has used iconic images and legendary personalities to make his point. Now, the time has come to take it off the catwalk and put it in an art gallery. Triumph of the Sign is where opposites meet; classical masterpieces pitted against brand logos, consumer culture versus highbrow art. You get the point. Castelbajac was friends with both Andy Warhol and Jean-Michel Basquiat and this is him continuing their work." 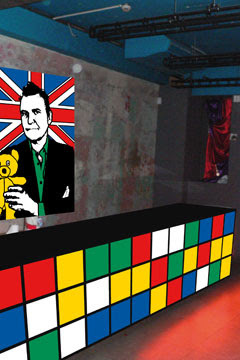 "THE IMMINENT arrival of French designer Jean Charles de Castelbajac in London, via the opening of his UK flagship store on Conduit Street, has the fashion pack abuzz - and VOGUE.COM has had an exclusive preview of the store's centerpiece: a Rubik's Cube till.